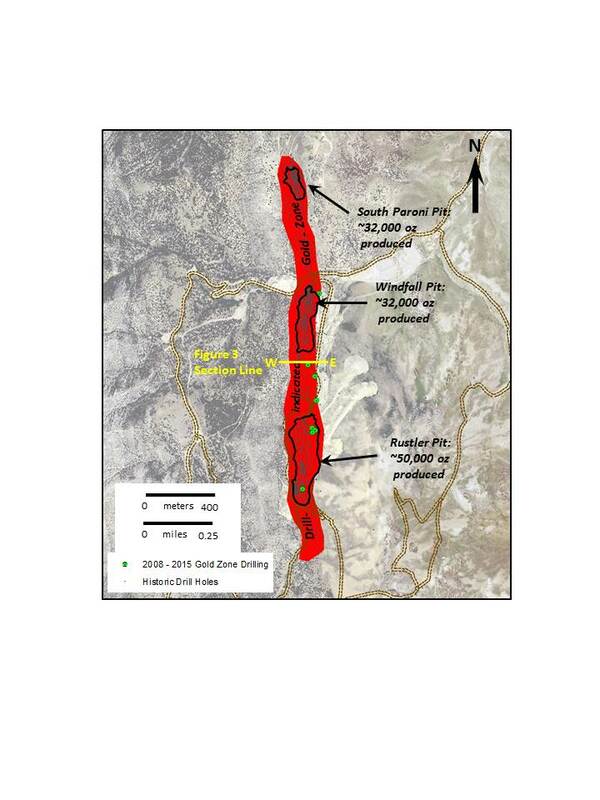 Coeur d’Alene, Idaho – July 10, 2018 – Timberline Resources Corporation (OTCQB: TLRS; TSX-V: TBR) (“Timberline” or the “Company”) announces an exploration update on its 23-square mile Eureka property (Figure 1) in Nevada’s prolific Battle Mountain – Eureka gold trend. At the Windfall project, Timberline’s exploration is focused on additional drilling to support development of an initial open-pittable oxide resource estimate. Work also continues at the Lookout Mountain Project on expansion of high-grade gold mineralization within the current resource area, and nearby at Oswego on the recently defined high-grade gold target. At Windfall, on-going fieldwork, combined with compilation of drilling data and geologic modeling, has traced a continuous zone of gold mineralization along a length of approximately 1.7 miles (2.7 km) (Figure 2). This includes mineralization that is exposed in and between the historic Rustler, Windfall, and South Paroni pits, which were mined in the 1970’s and 1980’s. These pits produced over 100,000 oz of gold from oxidized, near-surface ore and were among the first heap-leach mining operations in Nevada. Gold mineralization at Windfall occurs primarily in the upper-most Hamburg Dolomite beneath the Dunderberg Shale (Figure 3). 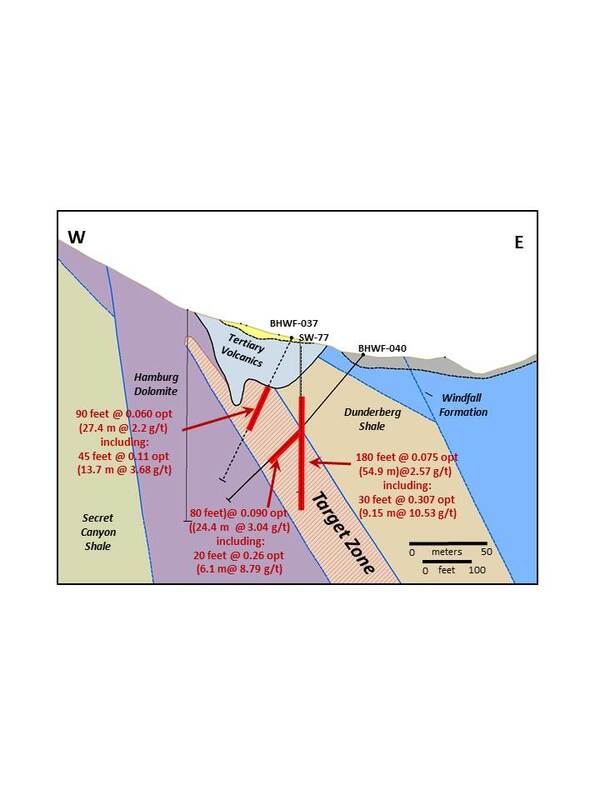 Historic drilling was commonly shallow, averaging 250 feet in depth, and much of the upper Hamburg–lower Dunderberg mineralized zone remains un-tested, including the extent of mineralization exposed in the high-walls and bottom of the mining pits. 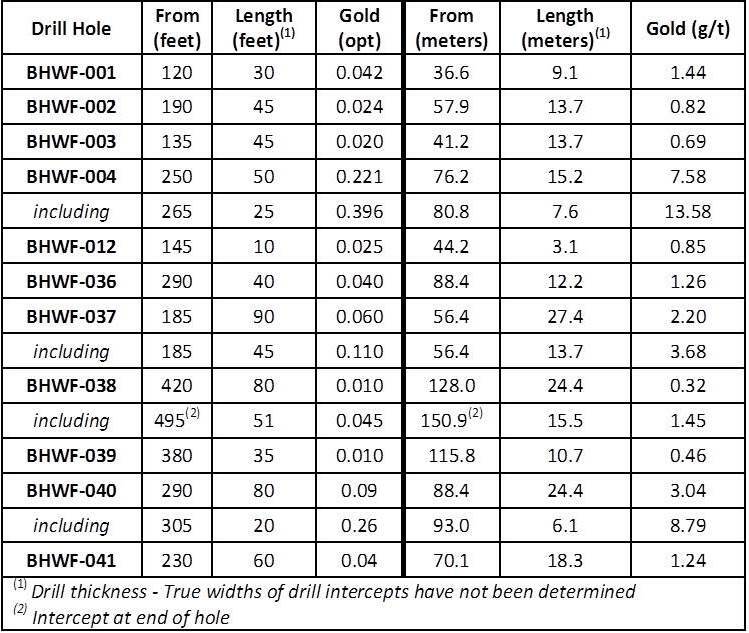 Timberline’s Windfall database includes approximately 1,300 historic drill holes with gold assay data. 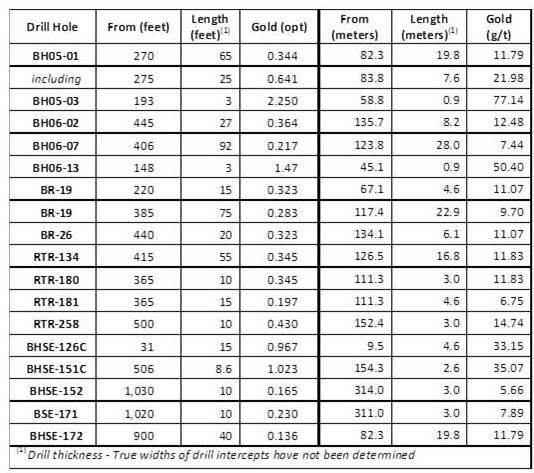 Within the mineralized zone at Windfall, over a distance of approximately 1 mile (1.6 km), there have been an additional 11 holes drilled since 2008 (Figure 2). These eleven holes intersected gold (Table 1) consistent with that in many of the adjacent historic holes. The potential quantity and grade of the Windfall Zone Target are conceptual in nature and there has been insufficient exploration to define a mineral resource. It is uncertain if further exploration will result in the target being delineated as a mineral resource. Elsewhere within the Eureka property (Figure 1), the Company completed detailed geologic review and reinterpretation of the Lookout Mountain gold deposit. 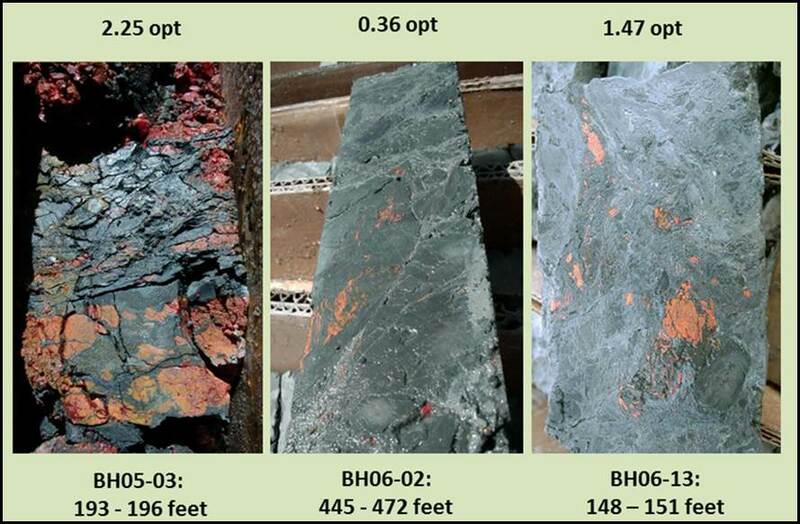 Work focused on internal geologic modeling of 17 intercepts of high-grade (>0.136 opt & up to 2.250 opt) gold mineralization (Table 2) that is associated with extensive zones of structurally controlled fault- and gouge-breccias, as well as carbonaceous collapse-breccia. The high-grade gold is associated with orpiment and realgar (arsenic sulfides), which are commonly found in many major Carlin-type gold deposits (Figure 4). The Company has initiated a surface rock sampling program at Windfall and is developing a drill plan that includes validation of historic drill assay intercepts and testing the expansion potential of the mineralized zone. The project is fully permitted for this drilling. An initial NI 43-101 gold resource study at Windfall is planned for later in 2018. 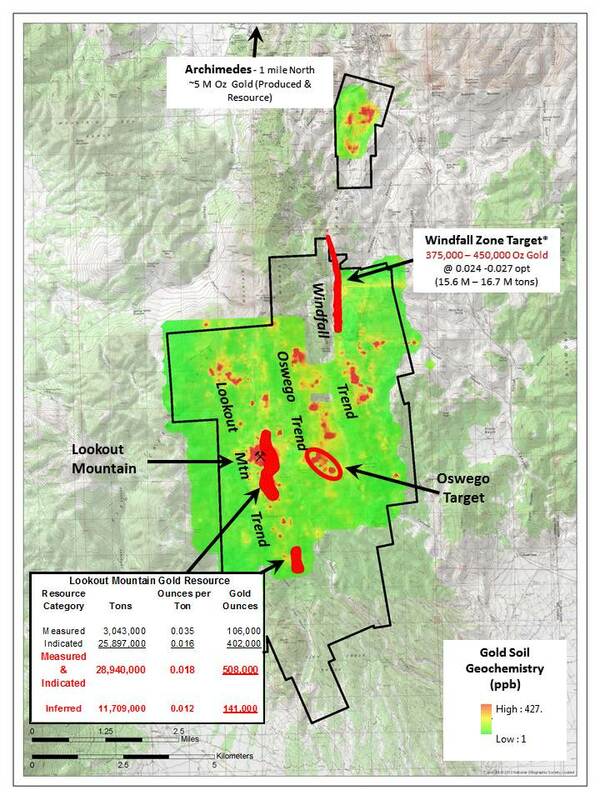 This resource will augment the total current gold resource in the Lookout Mountain area of the Eureka property. At Lookout Mountain, geologic modeling is focusing on geophysical data and the relationship between major fault structures, including their possible association with the nearby Oswego Zone high-grade gold mineralization (see Press Release dated June 12, 2018 at http://timberlineresources.co/media/). In addition, a drilling plan is being developed for Lookout Mountain to test for expansion of the high-grade gold zone, and to further delineate the association with high-grade gold mineralization at Oswego. The Lookout Mountain drilling is fully permitted under a Plan of Operations. 1)	0.006 opt (0.21 g/t) cut-off applied to oxidized material to capture mineralization potentially available to open pit extraction and heap leach processing. 0.030 opt (1.03 g/t) cut-off applied to unoxidized material to capture mineralization potentially available to open pit extraction and lower heap leach recoveries or sulfide processing. 2)	Rounding may cause apparent discrepancies. 3)	Refer to Updated Technical Report on the Lookout Mountain Project, MDA, effective March 1, 2013, Filed on SEDAR April 12, 2013. Steven Osterberg, Ph.D., P.G., Timberline’s President and Chief Executive Officer, is a Qualified Person as defined by National Instrument 43-101 and has reviewed and approved the technical contents of this release. Mr. Osterberg is not considered independent of the Company as defined in Section 1.5 of NI 43-101. Timberline Resources Corporation is focused on advancing district-scale gold exploration and development projects in Nevada, including its 23 square-mile Eureka property, comprised of the Lookout Mountain, Windfall, and Oswego projects which lie along three separate structural-stratigraphic trends defined by distinct geochemical gold anomalies; and as the expected operator of two joint venture projects – the Paiute project joint venture with a subsidiary of Barrick Gold, and the Elder Creek project joint venture with McEwen Mining. All of these properties lie on the prolific Battle Mountain-Eureka gold trend. Timberline also owns the Seven Troughs property in northern Nevada, known to be one of the State’s highest grade, former gold producers. Timberline has increased its owned and controlled mineral rights in Nevada to over 43 square miles (24,500 acres). Detailed maps and NI 43-101 estimated resource information for the Eureka property may be viewed at http://timberlineresources.co/. Statements contained herein that are not based upon current or historical fact are forward-looking in nature and constitute forward-looking statements within the meaning of Section 27A of the Securities Act of 1933 and Section 21E of the Securities Exchange Act of 1934. Such forward-looking statements reflect the Company’s expectations about its future operating results, performance and opportunities that involve substantial risks and uncertainties. These statements include but are not limited to statements regarding additional drilling to support development of an initial open-pittable oxide resource estimate at Windfall, expansion of high-grade gold mineralization within the current resource area at Lookout Mountain, having sufficient data to calculate an initial oxide gold resource at Windfall, high-grade gold mineralization at Lookout Mountain, possible connections between our Lookout Mountain resource and the recently identified high-grade gold mineralization at Oswego, intention to follow up on the potential links between project areas, an opportunity for substantial resource expansion at Eureka, development of a drill plan that includes validation of historic drill assay intercepts and testing the expansion potential of the mineralized zone at Windfall, augmentation of the total current gold resource at the Eureka property, a drilling plan being developed for Lookout Mountain to test for expansion of the high-grade gold zone, and to further delineate the association with high-grade gold mineralization at Oswego, plans to advance exploration at the Windfall and Lookout Mountain projects on the Eureka property, particularly this year; the availability and allocation of financial and other resources in this regard; calculation of an estimated NI 43-101 resource on the Windfall trend; and the ability to expand the NI 43-101 resource at Lookout Mountain. When used herein, the words “anticipate,” “believe,” “estimate,” “upcoming,” “plan,” “target”, “intend” and “expect” and similar expressions, as they relate to Timberline Resources Corporation, its subsidiaries, or its management, are intended to identify such forward-looking statements. These forward-looking statements are based on information currently available to the Company and are subject to a number of risks, uncertainties, and other factors that could cause the Company’s actual results, performance, prospects, and opportunities to differ materially from those expressed in, or implied by, these forward-looking statements. Factors that could cause or contribute to such differences include, but are not limited to, risks related to changes in the Company’s business and other factors, including risk factors discussed in the Company’s Annual Report on Form 10-K for the year ended September 30, 2017. Except as required by law, the Company does not undertake any obligation to release publicly any revisions to any forward-looking statements. Certain of the technical information referenced in this press release uses the terms “mineral resource,” “measured mineral resource,” “indicated mineral resource” and “inferred mineral resource”. We advise investors that these terms are defined in and required to be disclosed in accordance with Canadian National Instrument 43-101 – Standards of Disclosure for Mineral Projects (“NI 43-101”) and the Canadian Institute of Mining, Metallurgy and Petroleum (the “CIM”) – CIM Definition Standards on Mineral Resources and Mineral Reserves, adopted by the CIM Council, as amended; however, these terms are not defined terms under the United States Securities and Exchange Commission’s (the “SEC”) Industry Guide 7 (“Guide 7”) and are normally not permitted to be used in reports and registration statements filed with the SEC. Under Guide 7 standards, a “final” or “bankable” feasibility study is required to report reserves, the three-year historical average price is used in any reserve or cash flow analysis to designate reserves, and the primary environmental analysis or report must be filed with the appropriate governmental authority. Disclosure of “contained ounces” in a resource is permitted disclosure under Canadian regulations; however, the SEC normally only permits issuers to report mineralization that does not constitute “reserves” by Guide 7 standards as in place tonnage and grade without reference to unit measures. “Inferred mineral resources” have a great amount of uncertainty as to their existence, and great uncertainty as to their economic and legal feasibility. It cannot be assumed that all or any part of an inferred mineral resource will ever be upgraded to a higher category. Under Canadian rules, estimates of inferred mineral resources may not form the basis of feasibility or pre-feasibility studies, except in rare cases. Investors are cautioned not to assume that all or any part of an inferred mineral resource exists or is economically or legally mineable. As a reporting issuer in Canada, we are required to prepare reports on our mineral properties in accordance with NI 43-101. Investors are cautioned not to assume that any part or all of mineral deposits in the above categories will ever be converted into Guide 7 compliant reserves.